We always believe Sahara as the world’s largest desert, but in actual it is not. The largest desert in the world is Antarctica and Sahara is the largest Hot desert in the world. But Still, the Sahara is pretty and getting bigger day by day, currently covering an area of about 9 million km2. The Sahara covers large parts of Algeria, Chad, Egypt, Libya, Mali, Mauritania, Niger, Western Sahara, Sudan and Tunisia amounting to 31% of Africa. 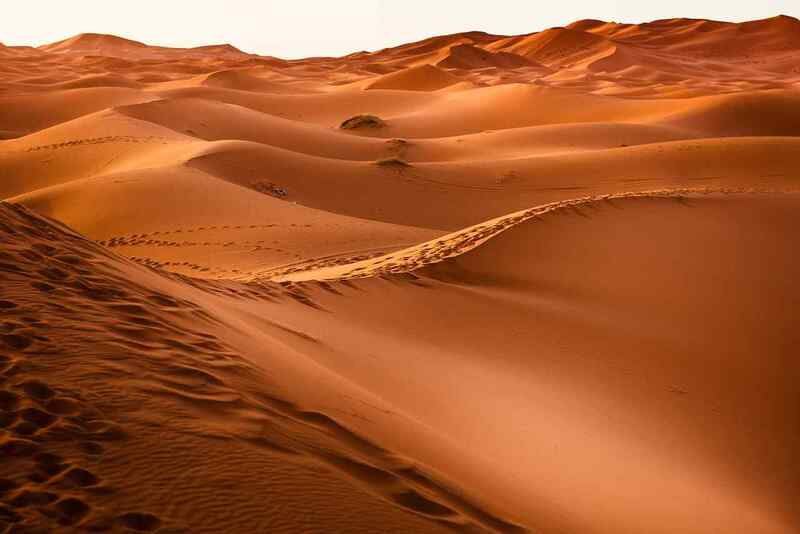 The Sahara desert is huge enough all the United States and it means “desert” in Arabic and hence the meaning of “Sahara Desert” would be called as “‘Desert’ Desert”. Sahara experiences a tropical climate with extreme weather conditions. During the day the temperature may reach 50°C, when at night it may fall to below 0°C. Also, The Sahara’s northeasterly winds often give rise to sandstorms and dust devils. Half of the Sahara receives less than 250 mm of rain per year, and the rest receives up to 1000 mm per year, making rain usually an infrequent torrential. The Sahara is the largest desert, covering 9 million km2. The Sahara is basically divided into western Sahara, the central Hoggar (Ahaggar) Mountains, the Tibesti Mountains, the Air Mountains, Adrar des Iforas and the Red Sea hills and high plateaus. Tenere desert and the Libyan desert in Sahara is the aridest region. Also, the highest peak in Sahara is the volcano Emi Koussi located at an elevation of 11,204 feet in the Tibesti Mountains in northern Chad. One of the most amazing facts about the Sahara is that Saharan peaks are camouflaged with snow during the winters. But, the Sahara has distinct elevations and is geographically a rocky desert. However, it contains underground rivers that come out in the form of the oasis. Also, many peaks in the Sahara are also known to be volcanic. According to Forbes, this desert snow is due to high-pressure systems in Europe. Moreover, the most popular snowcapped Atlas Mountains in Sahara is a popular trekking destination. There is an ancient lake existed beneath the Sahara that keeps itself alive with a 110′ deep root system. There have been also some pieces of evidence that mega lake existed beneath the Sahara at one point covering over 42,000 square miles. The Sahara has only two perennial i.e. the Nile and the Niger, but it has substantial underground reservoirs or aquifers. The Nile rises in the south of the Sahara and flows northward towards the Mediterranean. The Niger rises in the southwest of the Sahara and moves towards the Gulf of Guinea. The Sahara has nearly 20 or more lakes, of which only one is with potable water i.e. Chad. It is a shallow Lake which is continually expanding and shrinking at the southernmost edge of the Sahara. It is interesting to know that Sahara hosts about 1200 species of plants that mainly includes succulents, trees, shrubs, herbs, and grasses. The Saharan plants are easily adaptable to heat and drought conditions. In addition to that, many varieties can survive even in salty conditions as well. Also, the driest part of the Sahara i.e. South Libyan Desert also harbours very few species of plants. There is a plant in the Sahara desert known as Resurrection Plant that can survive over 100 years without water. The plant dries up and rolls around the desert until it will find a wet ground and buds happen to grow shortly after that. One of the most surprising factors about the Sahara Desert. Sahara desert is home to some of the most fascinating animal species in the world. The animals that inhabit Sahara desert are quite unique and they can be rarely found elsewhere in the world. The Saharan most incredible animals species include Dromedary Camels, Dorcas Gazelle, Dung Beetle, the Addax Antelope, Deathstalker Scorpion, Ostrich, Monitor Lizard, Fennec Fox, horned Vipers, and many more. These endangered species of reptiles are found only and only in Sahara. But scientists have also found the evidence of the existence of river animals like crocodiles and they have also discovered the fossils of Dinosaurs, Jobaria, Afrovenator, and Ouranosaurus in the Sahara desert. According to estimates, the Sahara has an entire population of fewer than two million people, including those who live in permanent communities near water sources, and Nomad tribes who move from place to place with the seasons. But scientists believe that Sahara was habitable once upon a time and there used to be more population than what is in the present time. But in course of time, the climate of Sahara desert has undergone dramatic changes which led to the extinction of many flora and fauna species and people as well. The Sahara desert was fertile and well-watered land about eight thousand years ago. It had a well-developed grassland ecosystem and was a much cooler place than it is today. Researches show that there used to be green and thriving vegetation in Sahara that supports the life of millions of living beings including flora, fauna and humans. These are the incredible facts about the Sahara desert. Do post your comments.